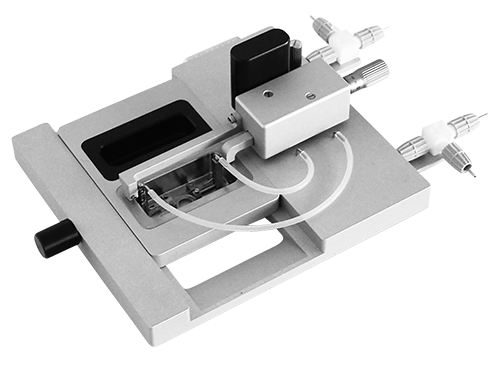 The Pressure Myograph System - 115FP is designed for biochemical or morphological studies where rapid freezing or fixing of the intact, pressurized vessel is required. After rapid freezing or fixation, the vessel can be used in studies such as morphological analysis or immuno-histochemistry. A built-in heating system maintains the chamber temperature, eliminating the need for continuous (and often costly) superfusion. The chamber cover includes ports for superfusion, for rapid draining and filling, for cumulative addition of drugs and for oxygenation. To facilitate cleaning, the chamber is made of acid resistant stainless steel. Because of the nature of the technique, physiological responses such as the myogenic response can be measured. The new state-of-the-art Pressure Myograph software MyoVIEW will collect data such as vessel wall thickness, changes in vessel and lumen diameter, intravascular pressure, and a host of other calculated parameters. The experimental chamber is made of stainless steel and contains a window at the base of the chamber, allowing the vessel to be digitized for dimension analysis. The adjoining removable chamber is used for freezing or fixation. Rapid freezing or fixation is achieved by simply raising the segment holder with the mounted vessel to the POM chamber, which takes less than a second. Upright Zeiss, Nikon microscope or Motic (contact DMT for further specifications) with USB camera, PC and MyoVIEW. "Sphingosine 1-phosphate and control of vascular tone"